On Saturday Nov. 12th, New Futuro and Allstate partnered to host a college informational fair at the University of Illinois Forum in Chicago. This free event offered a variety of informative workshops for parents and future college students. The workshops discussed topics like- navigating through college process, scholarships, financial aid and alternate ways of paying for college. Current college students shared their experience about going to college. Some of the universities and non-profits present included: DePaul, Northeastern Illinois University, Roosevelt University, Northern Illinois University, Art Institute of Chicago. Non-profits included Mujeres Latinas, HACE, Casa Central, Chicago Scholars, Gads Hill Center and many more. Ten students received a $1,000 scholarship and one lucky winner received a $4,500 scholarship. 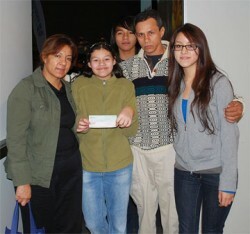 Damaris Garcia, a student and Chicago resident was one of the $1,000 scholarship recipients. Her mom, Ruth Montes de Oca said that they found out about this event when they were searching online to learn how to fill out a college application. That is when she saw the New Futuro link and immediately visited the website. “The New Futuro website said that they were going to have an event here in Chicago, so we immediately decided to come,” said Montes de Oca. Montes de Oca said that the workshops at this event did help her and her family learn more about the requirements and process of applying to college. “I like to cook, so I want to be a Chef,” said Damaris. “This is a great opportunity because the Hispanic community needs programs and people like this to motivate our youth. I’m keep encouraging my kids to keep studying because, that is the only way they will have a better future and not just for them, but for the generations after them. Education is very, very important. We must strive to better ourselves,” said Montes de Oca. This event definitely addressed many questions and many of the attendees left with many resources to find additional information about college. If you are interested in learning more about New Futuro, their future workshops and other college resources, in Spanish and English, visit: www.newfuturo.com.